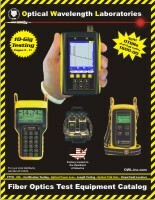 Several models of OWL fiber test equipment have charger ports which can be used for continuous wall operation or for recharging re-chargeable 9V batteries. NOTE: RE-CHARGEABLE BATTERIES ARE NOT INCLUDED WITH OWL TEST EQUIPMENT AND MUST BE PROVIDED BY THE USER. SAFETY NOTICE: using these transformers while non-rechargeable batteries are in the unit may produce an unsafe condition, and may cause harm to the equipment or the user. NOTE: MO-2V, WT-1V, ZO-2V, and ZO-2SV do not include a charger port. A VFL (Visual Fault Locator) is installed in place of the charger port.